Abalone shells are characterised by their ear-like appearance. They are nocturnal and at night move about, rasping algae off the rocks with a powerful ‘tongue’ or radula. 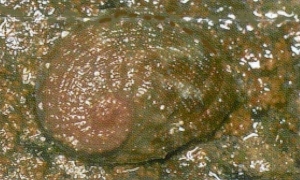 Water is drawn in under the front of the shell, passed over the gills and then pumped out a series of holes on the edge of the shell.